Look after all of us like royalty for my 50th.. brilliant service and the food was amazing!! Very nice place and lovely cocktails! Thanks to Aoife, Gillian and the rest of the crew for a fab team lunch. The service and food was exceptional as always. The room we had was perfect for our Christmas party. The food and services was excellent. We would definitely recommend The Bridge. I booked the River room for a private party of 30. Perfect size, beautiful room. Finger food was of an excellent standard and complimented by all. My only complaint is the night wasn’t long enough and over at 12.30. Would recommend here for anyone looking to host a similar event. Emma very good to deal with and organize. All in all a perfect venue. Delighted to get to experience another great meal on the evening of our engagement, The Bridge 1859 has a special place in our hearts as been the choice for our first date many years ago. Friendly staff, lovely atmosphere and very accommodating with our booking. Thank you to all who make The Bridge 1859 an excellent restaurant. We celebrated our 40th wedding anniversary lats Saturday evening in the The River View Room at The Bridge. The staff were brilliant the level of service was second to none and the food was first class. Thank you guys for a great night. 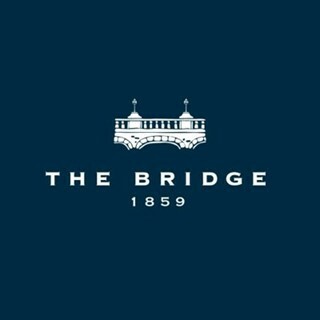 I would not hesitate to recommend The Bridge 1859 for your celebration. Thank you all for another really wonderful visit to The Bridge on Saturday. Wonderful welcoming staff and great service. Delicious food. And a warm and friendly atmosphere. As always. Our favourite place. Thank you all so much. See you soon again. Had reserved an areas Friday evening for 35 people for a work event, and the service was fantastic. Food delivered on time, and the staff went out of their way to help. Will definitely look in to hosting future events here. Special mention to Paloma and Aoife for their help on the night. Everything was great - from my initial enquiry to the event itself the staff were so helpful and accommodating. Really impressed with The Bridge! We hired both rooms upstairs to celebrate our recent wedding. I can honestly say the service we received was excellent. Nothing was too much hassle! Really fantastic place with great staff. Paloma was great and took care of our family & friends. Dave and Colm really impressed our parents with help setting up room and projector. WONDERFUL WARM FRIENDLY PUB WITH GREAT FOOD & SERVICE PROFESSIONALLY RUN!!! A very enjoyable experience in the Bridge. Service and food top class. Staff extremely friendly. Room size was excellent, staff very friendly and food was very good standard finger food. Great night, delish food & great service for party of approx 18 people - thank you. Service was great. The room was perfect and we all had a really enjoyable night. Thanks to all the staff at the Bridge for helping to organise our event. They couldn't have been nicer. The venue was excellent, and I will be recommending it to friends.